So, I'm hooked, and I don't want to stop making pickles, esp when you taste how good these are, even very warm, right out of the pot. 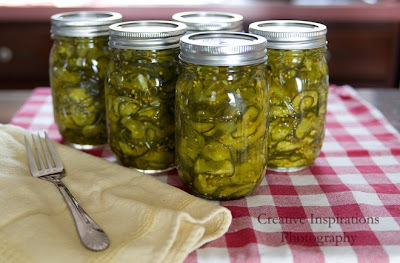 (I have to confess, I ate most of the left overs, that I couldn't squeeze into the jars....I'm off to find more cukes today, so I can make batch 3 with Splenda. I believe I got this recipe off of Allrecipes.com, but I'm not sure. I scoured the net the other night, and pulled off a few, and didn't mark the source of this one, sorry! 3.Add salt and cover with ice. Mix well. Let stand for 3 hours. 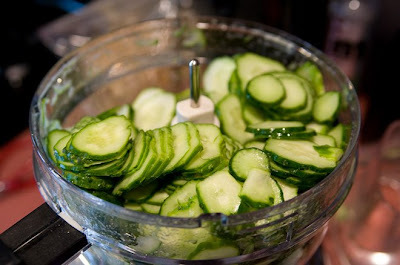 4.Drain the cucumber mixture well. 5.Transfer the mix to a large pot, add all remaining ingredients. Bring just to a boil. 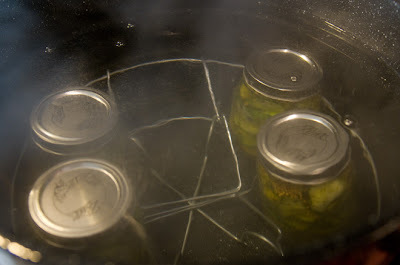 6.Pack cucumber mix into hot sterilized 1 pint jars. Allow to sit in a cool dark location for at least 2 weeks prior to use. 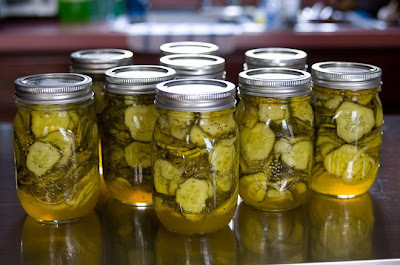 I got 5 pints with left over brine, so I think next time, I'd up the cucumbers to 25-28. Supposedly, the Splenda recipe online, is very close to this one, but using only about 2 1/4- 2 1/2 cups of splenda, instead of the 5 cups of sugar. If these taste as good or better in 2 weeks, after they tasted so good in the pot, these are going to be terrific! I know I haven't blogged in so long, but this was worthwhile mentioning, at least for me! My hubby bought me a canning pot with accessories recently from a garage sale, so I felt I really should use it. 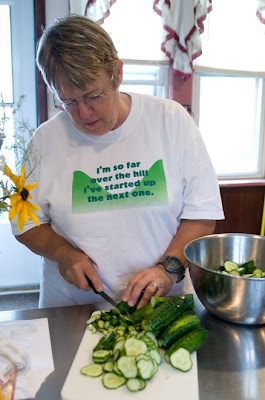 I bought some great looking pickling cukes from the Amish at a farmer's market, and I wish I had bought more now. Anyway, here is my journey this am. I also had the assistance of my sister, who is in the picture, and is here visiting from NM, and leaves to go back home tomorrow. I have to say, that I ended up cheating and didn't use a recipe, since Walmart was out of Mustard seed, so I bought a packaged mix to make the bread and butter pickles. 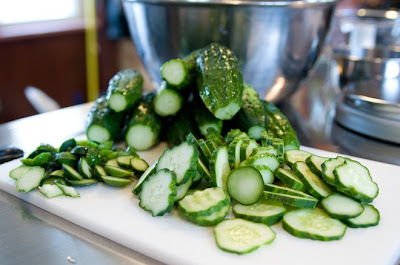 I would have spent all morning slicing these cukes by hand, if it hadn't been for Jan asking me why I wasn't using my new Kitchen Aid food processor. In all honesty, I hadn't even thought about it, since I'm still not used to having it to help me out. It went so much faster, using it to do the slicing! And here is the final product....I'm totally hooked, and I want to make more.....and I may be able to on Sunday! I just need to find some more cucumbers!